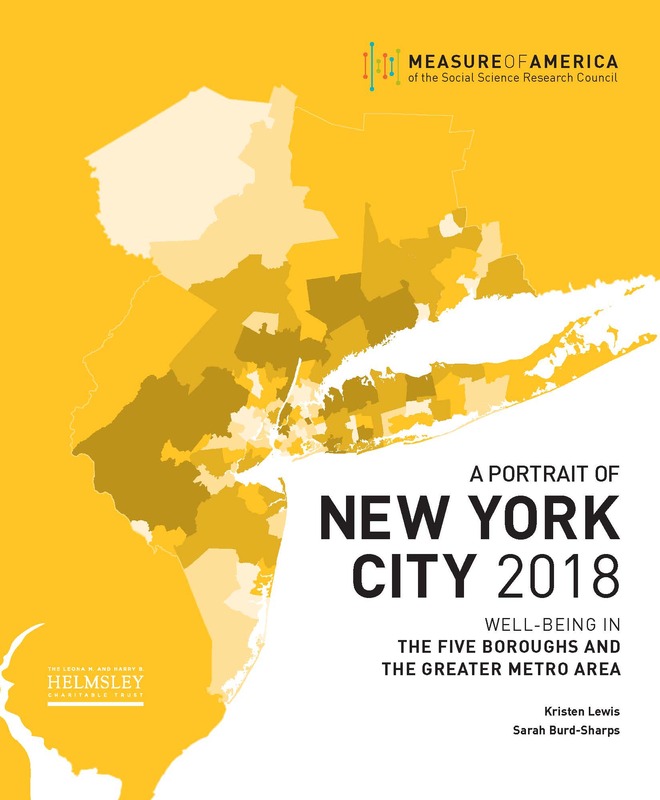 A Portrait of New York City 2018: Well-Being in the Five Boroughs and the Greater Metro Area examines well-being and access to opportunity for different geographies and demographic groups in New York City and the greater New York–New Jersey–Connecticut metropolitan area using the human development framework and index. A Portrait of New York City 2018: Well-Being in the Five Boroughs and the Greater Metro Area examines well-being and access to opportunity for different geographies and demographic groups in New York City and the greater New York–New Jersey–Connecticut metropolitan area using the human development framework and index. This report also examines a range of issues that contribute to and/or are compounded by the well-being challenges faced by many New York City communities, such as child poverty, health inequities, racism, and residential segregation. A Portrait of New York City 2018 (New York, NY: June 21, 2018).